Titan Iron Ore Corp. (TFER): Next Big Penny Stock Runner? Home» Commentary » Titan Iron Ore Corp. (TFER): Next Big Penny Stock Runner? 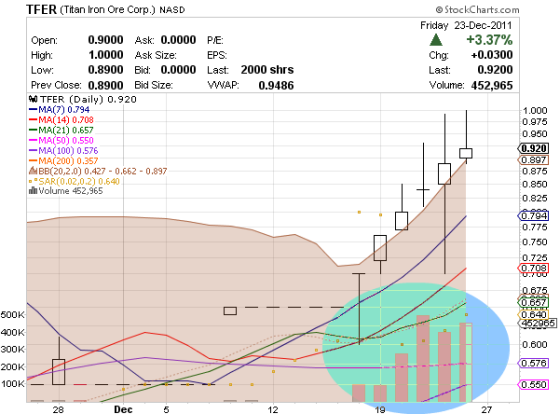 Is Titan Iron Ore Corp. (TFER) 2012’s next big penny stock runner? Will this up and coming, “billion dollar mining company” (to quote the Washington Financial Times) perform as well as some other notorious mining companies did in 2011? Titan Iron Ore Corp. is a junior exploration stage mining company focused on the rapidly expanding global iron ore mining sector. The company’s current management, who collectively possess decades of technical mining and managerial expertise, arrived along with the projects in June of 2011. Supatcha Resources (SAEI) and Lithium Exploration Group (LEXG) should ring a bell. Both of these mining [scams] could have made you very wealthy, and sent you to the poor house as well (had you taken a sip of the koolaid). So the key lies in knowing when to let go – or maybe knowing when to jump on the bandwagon to start. Here we have a chart showing Titan Iron Ore’s (TFER) performance over the last two weeks. Trading is reminiscent of the accumulation investors saw in shares of both Supatcha Resources (SAEI) and Lithium Exploration Group (LEXG) before a memorable run-up (and, eventually, a notorious collapse). There are forces at work here beyond our understanding (well actually, we can almost always put a $$ figure on it). But that’s besides the point and every experienced penny stock trader knows it. So here at PennyStockHaven.com headquarters we like to go with the flow (which is what our penny stock alerts are all about) and give you nothing more than what you need to know. Here’s what we just said: Titan Iron Ore Corp. (TFER) looks a lot like Supatcha Resources (SAEI) and Lithium Exploration Group (LEXG) BEFORE they ran up 1000% (might be a few hundred % off there – yes a few HUNDRED %). Titan Iron Ore (TFER) is seeing massive accumulation and strong volume (trading interest). We think there’s likelihood this is the next big runner (but not the last) and maybe the first one that traders will be talking about in 2012. We already know the article in the Washington Financial Times was paid for. So this stock has all the markings of an upcoming pump. How far up this thing is probable to move really depends on how much stands behind this unexplainable force (sarcasm implied, we already said it can be explained – duh!). So keep your eyes open for anything that may suggest Titan Iron Ore is 2012’s next big penny stock runner (wait – that’s what we just did).